Whenever it has been a while since I have been to Hawaii, I start to suffer from acute ahi tuna poke withdrawal. I LOVE ahi tuna. I would eat it every day (and at almost every meal) if I could. In Hawaii, ahi tuna is slightly less expensive than on the mainland and is always super fresh, so it’s like heaven for me. Yesterday, I couldn’t take it any longer, so I had to go out and buy a nice big piece of ahi tuna and make ahi tuna poke. What is ahi tuna poke? 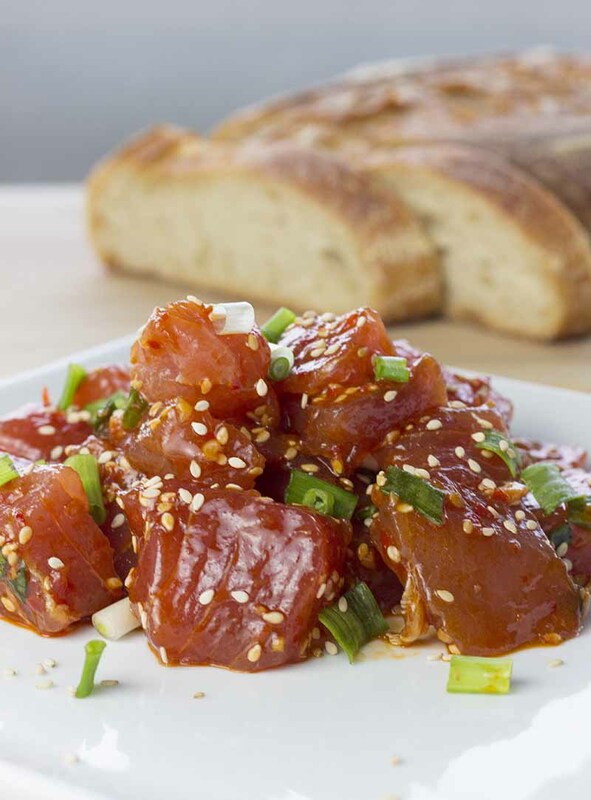 Poke is a classic Hawaiian way of preparing raw fish with soy, sesame oil, and spices. It’s basically Hawaiian sushi. 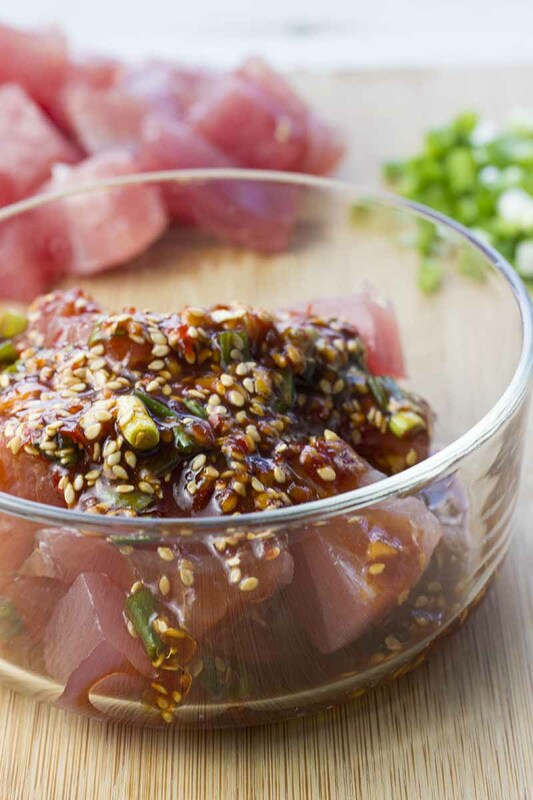 Ahi tuna poke is probably the easiest fish dish to make, as you don’t have to cook anything. You just mix all the ingredients and eat :). It takes less than 10 minutes to prepare enough poke for four people. You should eat the poke fairly soon after preparing it. The soy and sesame oil mix isn’t a marinade (it doesn’t change the texture of the fish) so there is no reason to let it sit in the fridge for more than an hour, which is all it takes to get all the flavors mixed. You can even eat it right away and it will still taste fantastic. Because all the ingredients are raw, you have to use super fresh, high-quality fish. I only buy ahi tuna in Whole Foods or directly from a good fish market. 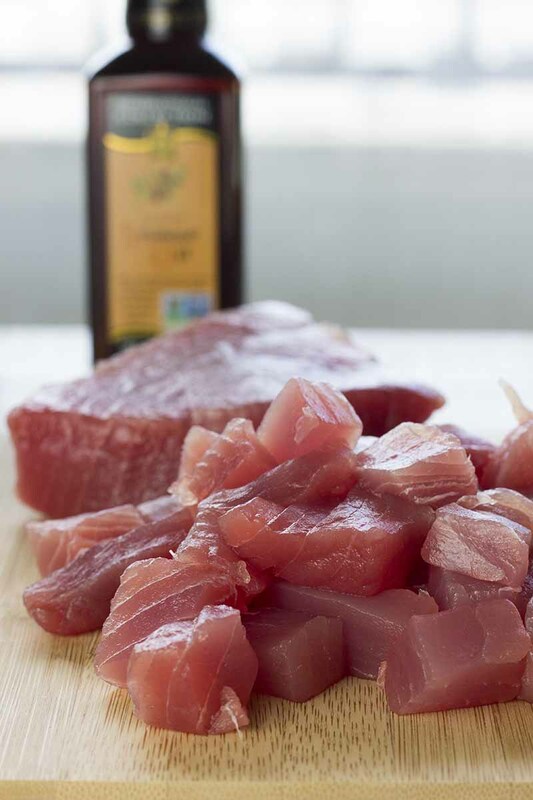 Cut the ahi tuna into small cubes, about an inch on each side, and set it aside while you prepare the other ingredients. All ahi tuna poke recipes use essentially the same base (ahi tuna, soy sauce, and sesame oil), but you can use many different spices. Just be careful not to overwhelm the mild ahi flavor. I like a little bit of kick to my Ahi Tuna Poke, so I use chili and garlic sauce and green onions. You should be able to get all the ingredients other than the ahi tuna in most grocery stores. If you cannot get the chili garlic sauce, you can use a little finely chopped fresh chili instead. Mix the soy sauce, sesame oil, and chili paste in a bowl. Chop the green onion and add them to the bowl along with the sesame seeds. Add the ahi tuna cubes to the bowl (or the other way around like I did here) and mix everything. At this point, you need to make a decision. You can either add the avocado now or wait until shortly before you serve the poke. If you add the avocado now, it will have more time to absorb the flavors but the poke will also look a little more “messy”. If you wait, the presentation will be cleaner when you serve the dish. If you want this to be a diet dish, use a little less avocado and sesame oil than I did. 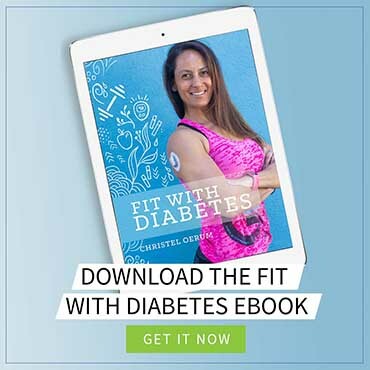 The ahi is pure protein, and all the fats are really healthy, but a whole avocado can be a little calorie dense if you are trying to lose weight. 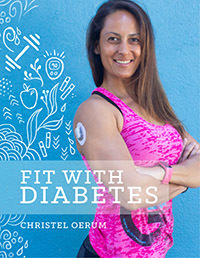 I promise you, after you try this recipe just once, it will be one of your favorite healthy indulgences. It’s mild but flavorful, easy to make but luxurious, and guaranteed to impress anyone you make it for (not that you will want to share…). 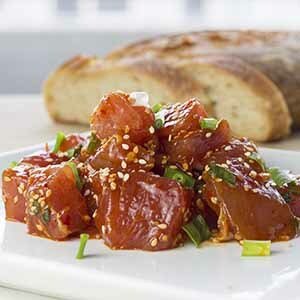 Ahi Tuna Poke is a classic Hawaiian way of preparing raw fish with soy, sesame oil, and spices. It’s basically Hawaiian sushi. Rinse the ahi tuna and cut it into bite-sized cubes. Rinse the green onions and chop them finely. 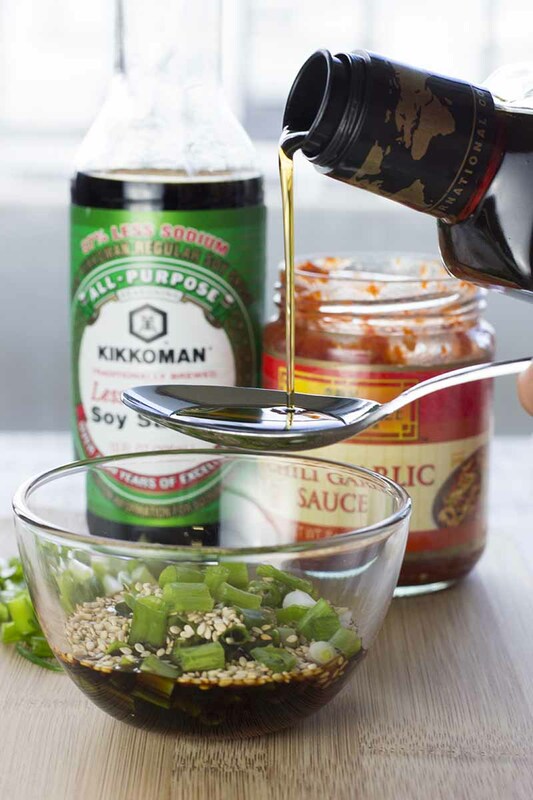 Mix soy, sesame oil, chili garlic sauce, green onion and half the sesame seeds in a bowl. Add the ahi to the dressing and mix well. You can let it sit in the fridge for 10-20 min for the flavors to mix, but you don’t have to. Cut the avocado into small cubes and gently mix it into the rest of the dish right before serving. Sprinkle the remaining sesame seeds on top. Serve with chips or bread and enjoy! Where can you buy sushi grade tuna? We got some from our local Mariano’s then found out their quality may not be the best. We’ve made this 4 times now! Awesome recipe! Tweaked it with TOASTED sesame oil which we prefer. It was a big hit at a party we took it to with one person offering to buy it off us!!!! Ha,ha! I have been making Poke since I was stationed in Hawaii in the 80’s. I mix all of the ingredients except the Ahi in a bowl add fresh seaweed (about 2 cups for 4 people) and mix it well. Then I portion out the mixture into bowls, put the Ahi on top of each portion and serve with chop sticks. Yum-my. This is amazing!!!! Thank you so much!